HERAT -- A deadly clash between rival Taliban factions earlier this month has put a spotlight on the escalating level of infighting within the group in Herat Province. More than 200 militants have been killed and more than 300 others wounded over the past two years in deadly confrontations between the Taliban factions, Jilani Farhad, a spokesman for Herat provincial governor, told Salaam Times. "The infighting among Taliban groups began about two years ago in Herat and has continued to this day," he told Salaam Times. "These clashes took place in Shindand, Adraskan, Gulran, Guzara, Obe and some other districts in the province." 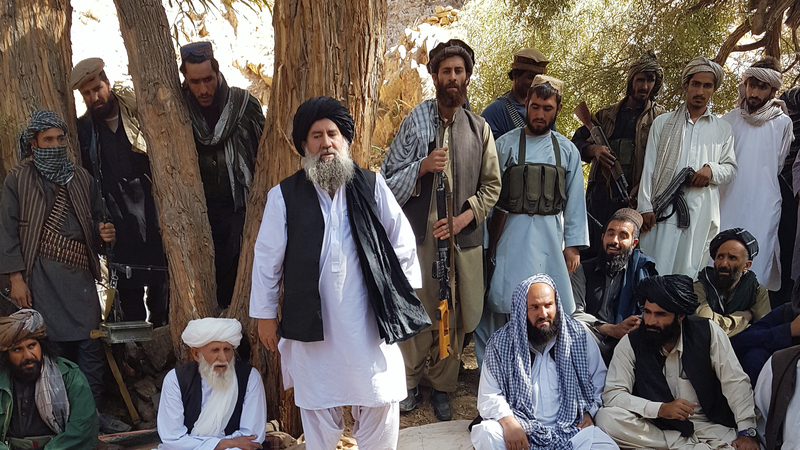 Taliban fighters loyal to Mullah Mohammad Rasool, including Mullah Manan Niazi (centre), are shown in Adraskan District, Herat Province, May 15, in a screen shot from Salaam Times' video. The internal tensions emerged shortly after the death of Taliban founding leader Mullah Mohammad Omar was made public July 9, 2015, almost two years after he had actually died. As a result, one Taliban faction comprising thousands of militants led by Mullah Mohammad Rasool split from the main Taliban group -- the Quetta Shura -- and declared itself an independent entity. The new group named itself "the High Council of Afghanistan Islamic Emirate." Rasool's faction splintered from the Quetta Shura over the ascension of Mullah Mohammad Akhtar Mansoor to leadership of the Quetta Shura Taliban. Rasool's followers, however, said Mansoor led the Quetta Shura to satisfy his personal greed. The two sides subsequently engaged in violent clashes, including in Shindad District in Herat more than two years ago, a fight that lasted for days and killed dozens of militants on both sides. Since then, more militants have perished from infighting, including as recently as October 8, when clashes left at least 17 fighters dead and 8 wounded in Guzara District. One side was led by the Taliban deputy shadow governor of Herat, Abdullah Samad Faroqi, known also as Mullah Samad. Mullah Samad was loyal to Mullah Mansoor, who was killed in a US drone strike in May 2016 in Pakistan, and now to his successor Mullah Haibatullah Akhundzada, the current leader of the Quetta Shura Taliban. The other faction, which backs Mullah Rasool's side, was led by Mullah Nangialai. On October 23, the seven-nation Terrorist Financing Targeting Centre (TFTC) sanctioned Mullah Samad and eight other Taliban officials. The Afghan government's push for peace talks with the Taliban has compounded some of the Taliban clashes as some factions seek to eliminate others in an attempt to gain an advantage in peace negotiations, analysts say. "The continuation of battles between various Taliban groups shows the extent of disagreements and the incoherence within the Taliban," said Abdulqader Kamel, a Herat-based political analyst. "This will lead those groups that are weakened on the battlefield to seek shelter on territory under the Afghan government's control," he told Salaam Times. "This will also provide the Afghan government and the High Peace Council an opportunity to embrace them openly." "The integration of these groups in the government can strengthen the peace process," Kamel said, adding, "The continuation of fighting and differences among Taliban militants will destroy their military structures and will weaken their members' fighting morale and spirit." "[The Afghan government can] redirect some of these groups towards the peace process," Sayed Ashraf Sadaat, a civil society activist in Herat, told Salaam Times. "The government can even attract some of these groups and use them for the purpose of security." "The government has acknowledged the existence of rifts among the insurgent groups... we genuinely hope the government will take advantage of those rifts and encourage them to join the peace process," Sadaat argued. The violent internecine disputes have already driven a number of demoralised Taliban members to join the peace process in Herat. "The clashes between the Taliban have contributed significantly to the Taliban militants joining the peace process in Herat," said Mawlawi Ghulam Sarwar Barakzai, chairman of the Herat Provincial Peace Council. "A group of Taliban in Shindand District has joined the peace process because of the pressure imposed upon them by another Taliban group," he told Salaam Times, adding, "We are in communication with both sides." "There are a number of individuals in one of the groups who do not fight against the government and are in favour of joining the peace process," Barakzai said. "They, however, do not want to lay down their weapons because of their fear of the other faction." The Taliban's internal clashes over leadership and power debunk the militants' claims that their war is a legitimate "jihad," religious scholars say. 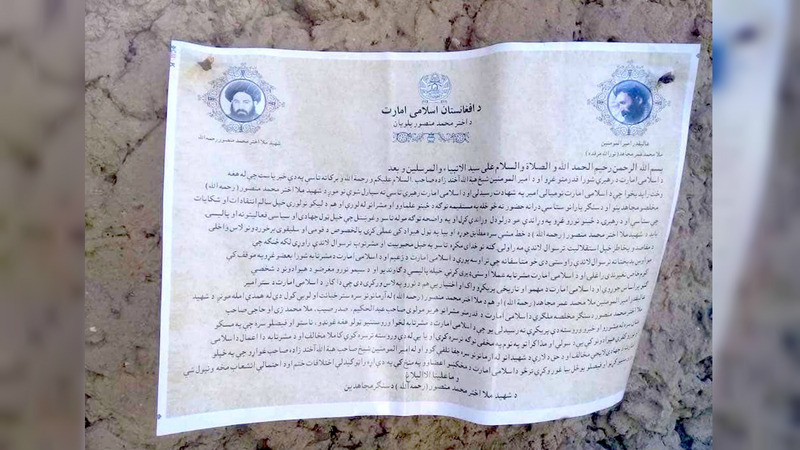 "Murder for the purpose of achieving power and money is illegitimate and prohibited and is rejected from the Islamic point of view," said Sayed Mohammad Shirzadi, director of the Herat provincial department for religious affairs and the Hajj. "The Taliban have been spilling the blood of innocent civilians and Afghan soldiers on the pretext of 'jihad,' while, in reality, they are nothing but savages and beasts who do not even show mercy to their own people," he told Salaam Times. "What justification does the Taliban have in order to explain the killing of their members?" he asked, adding that, "Do they still consider it a legitimate jihad when [they fight] their own [people]?" "If their answer is yes, then they cannot be considered Muslims. And if their response is no, then how can they ever justify the killing of all these human beings?" Shirzadi continued. "The holy religion of Islam strongly denounces war and fighting," he explained. "Jihad has its own conditions and requirements, and one may not haphazardly characterise any bloodshed and massacre as jihad." "The Taliban must know that they can no longer hide their crimes behind the word 'jihad'," he added. Mullah Manan Niazi, deputy leader of a splinter Taliban group under Mullah Rasool, said individuals loyal to Mullah Haibatullah Akhundzada sent three suicide bombers to assassinate him. The Taliban leadership is acting "based on the whims and objectives of the neighbouring countries and hostile regional states," according to a faction within the group.